Well, there are lots of people in the city who love the outdoors and love hiking and, fortunately, there are several active hiking groups who plan regular hikes throughout the year. We’ve listed a number of the hiking groups below and some information about each as they cover a range of hiking trails and have members of various ages and skill levels. If we’ve missed any or have gone on hikes with any of these groups and want to tell us of your experiences, please leave a comment below. The Wanderung Group is organized by email list where members subscribe to their email list and can plan their own hikes or join an organizers hike through the list. This may seem a bit loosely organized at the beginning but many of the trip organizers have been part of Wanderung for years. There is no cost to join the mailing list and the only cost is to make sure that you adequately reimburse the driver for gas, vehicle wear-and-tear, etc. Having been on a Wanderung hike in the past, I quite enjoyed the system as the group was limited to 8 participants (4 per car) and a central meeting place for the hike was at Broadway and Commercial. The nice part was hiking in a group of 8 as it was large enough to get to meet some new people and not so large that we become separated along the trail. Meetup is a popular site for finding local groups of interest and there are many Vancouver hiking groups with different niches, including dog walking, trail running, and more. The most active Meetup group is the Vancouver Hiking Meetup Group, which has well over 5,000 members and actively organizes events throughout the year, which include hikes, camping trips, canoe excursions, rock climbing, and social events. Membership is free to signup through the Meetup website and the cost for each event depends on the event being organized. The Chilliwack Outdoor Club focuses on hikes in the Fraser Valley, the Chilliwack Valley, Harrison Lake, Hope, the Coquihalla, and Manning Park, and there are plenty of great hiking options in these areas. 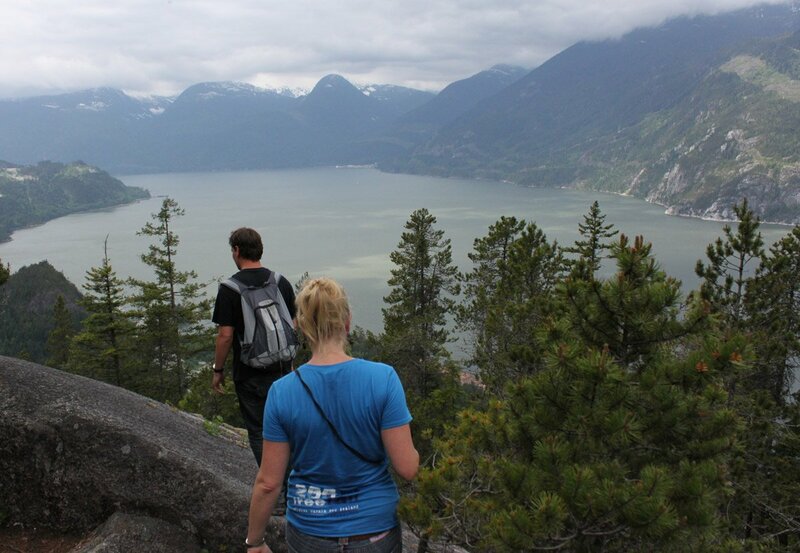 The club also does hikes in North Vancouver, giving Fraser Valley residents an opportunity to hike some of the lower mainland trails with a group of locals. Cost to join is $35.00 per year which allows you to take part in an unlimited number of organized events and gives you discounts at some local stores. Stopping on a wooden bridge along the Baden Powell trail in North Vancouver. Established in 1907, the BCMC is a group of outdoor enthusiasts who are passionate about the outdoors and participate in some pretty challenging outdoor activities, including hiking, backpacking, and mountain climbing. The BCMC has literally blazed new trails, creating new hiking trails and being the first group ascend several mountains. This is not a group for the casual weekend hiker, this is for experienced outdoors people looking to explore new areas and challenge themselves. Membership is $40 a year for adults and gets you a 10% discount at MEC. Know of any other hiking clubs in the Vancouver area? Leave a comment below and let us know. Hi, I am a co-organizer and event coordinator at the Maple Ridge Hiking Meetup Group. This is a group for outdoor enthusiasts, living healthy lifestyles interested in hiking and snowshoeing in the Maple Ridge, Pitt Meadows, Coquitlam, Port Moody, Abbotsford, Chilliwack, Vancouver, North Shore, Whistler, Hope and surrounding areas. Hikes will range from 4 to 8+ hour day trips of varying elevation, intensity and technical difficulty. Dogs are not allowed on hikes unless otherwise posted. any groups specifically for people 40 and over? Hi Canali… there are some meetup groups for the 40+ age range. You should check it out… free to register… and most groups are free… some charge a nominal annual fee. Hi Canali, 99% of our group is 40-50. We hike 2x a week, backpack treks and mostly lower mainland hikes. Hi, am browsing through ideas. I am fairly fit 55yr heading to Vancouver for a whole 4 days in Sept, 25th to 30th as part of a holiday to visit my daughter in Alaska. Never been there to Vancouver before , can you suggest a walk…..1/2 to one day that would be the most ‘spectacular’ for me to do. I like mountains, views, and wildlife, scenery. Not to mention accessible by public transport ! Hi Michael & Outdoor adventurers.